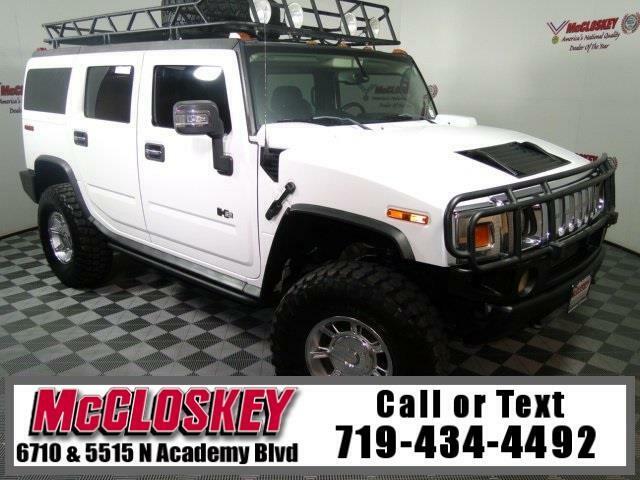 Well-equipped and rugged 2005 Hummer H2 4x4 with 37 Inch Tires, Rear DVD Player, Keyless Entry, Heated Leather Seats, Brush Guard, and Bose Premium Sound System! Two years ago, the Hummer H1, based on the military Humvee, was joined by the all-new Hummer H2. The H2 is based on GM's heavy-duty pickup trucks, but highly modified for increased off-road capability. Longer and taller than the original H1, the H2 is built at a new plant in Indiana. The interior is a bold design with lots of metallic flavorings here and there, black-on-white gauges shared with the high-end GM SUVs, and great seats. Overall, the interior works pretty well. The small vertical side glass makes you want to hunch over, making for an intimate cabin.